initiative Law for Peace Alliance of Religions Youth and Women Activism Peace Education Etc. project Legislate Peace Campaign WARP Office Peace Education Youth & Women Empowerment Raising Awareness Peace Walk WARP Summit Etc. 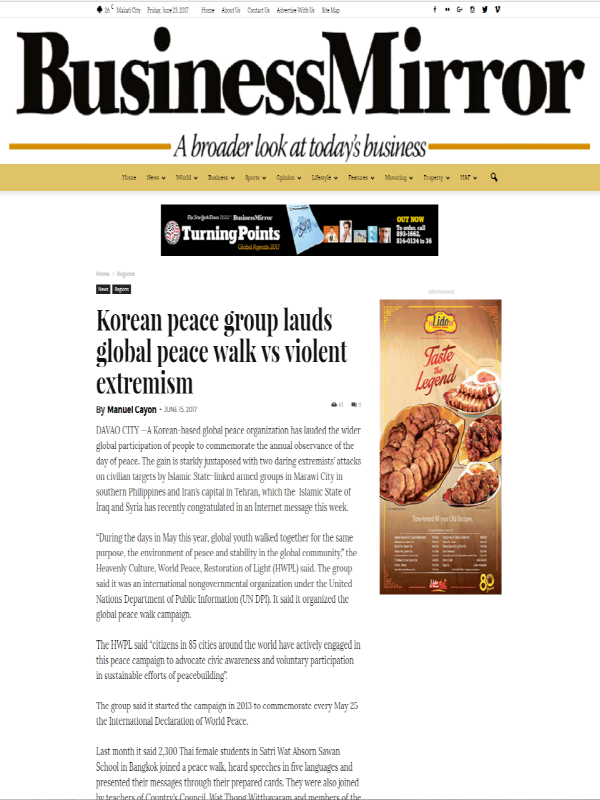 ( August 16, 2017, Seoul, Sri Lanka Guardian) Under the current global environment shaded by long-term violence around the world including terrorism and interethnic conflicts, the international society is seeking a conflict resolution through a long-term approach to peacebuilding – education. 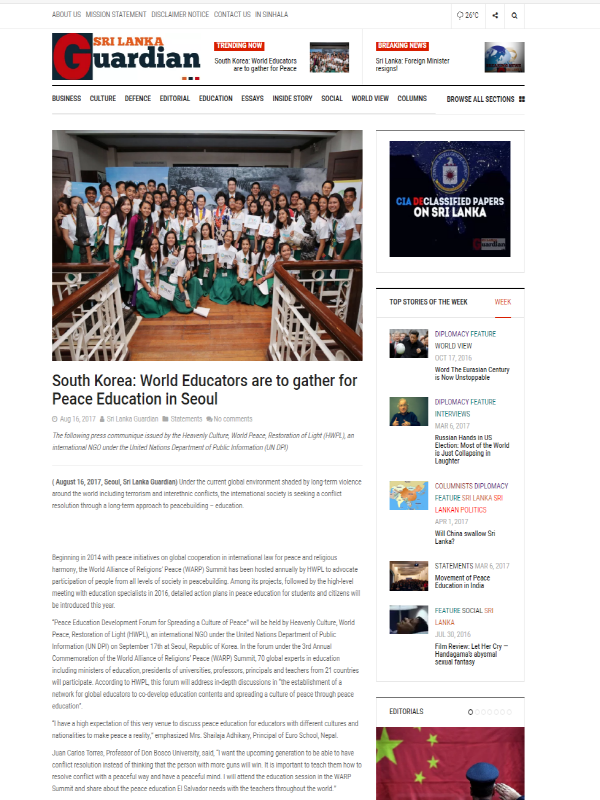 Inspiratifnews.com – Jakarta, Sebuah kuliah perdamaian khusus diadakan di Jakarta oleh sebuah perdamaian internasional Organisasi, Budaya Surgawi, Perdamaian Dunia, Pemulihan Cahaya (HWPL) untuk Mengenali kasus-kasus konflik di Indonesia dan menemukan solusi. Kuliah ini Diberikan kepada mahasiswa jurusan media di University of Mercovuana 8 Juli lalu. 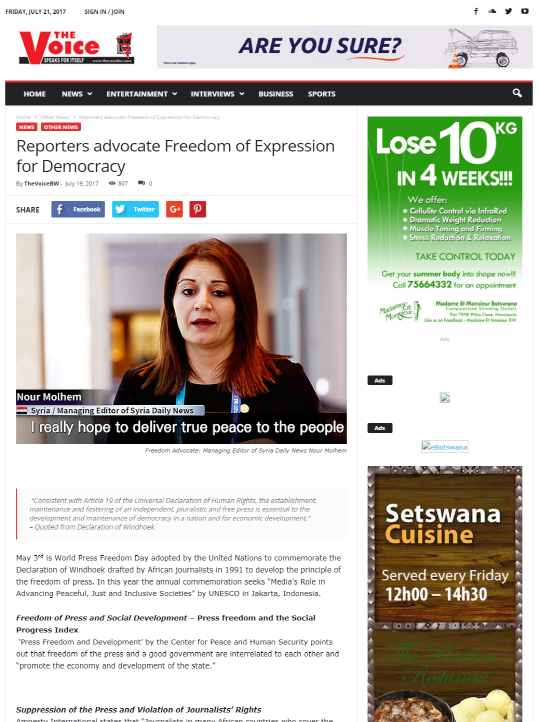 May 3rd is World Press Freedom Day adopted by the United Nations to commemorate the Declaration of Windhoek drafted by African journalists in 1991 to develop the principle of the freedom of press. 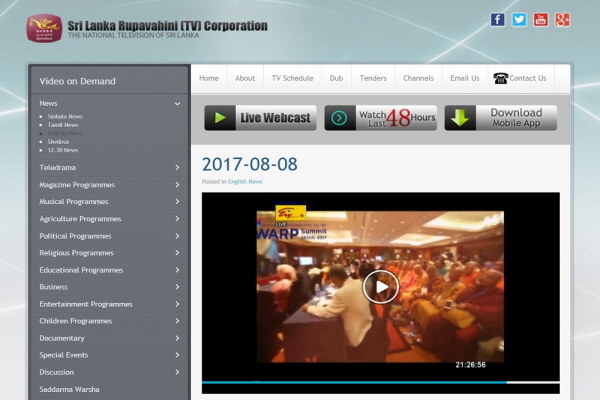 In this year the annual commemoration seeks “Media’s Role in Advancing Peaceful, Just and Inclusive Societies” by UNESCO in Jakarta, Indonesia. 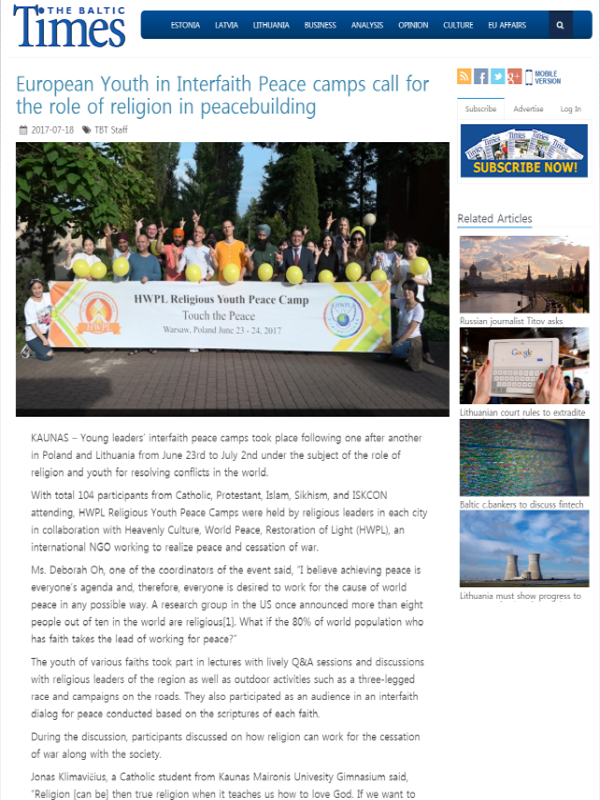 KAUNAS – Young leaders’ interfaith peace camps took place following one after another in Poland and Lithuania from June 23rd to July 2nd under the subject of the role of religion and youth for resolving conflicts in the world. 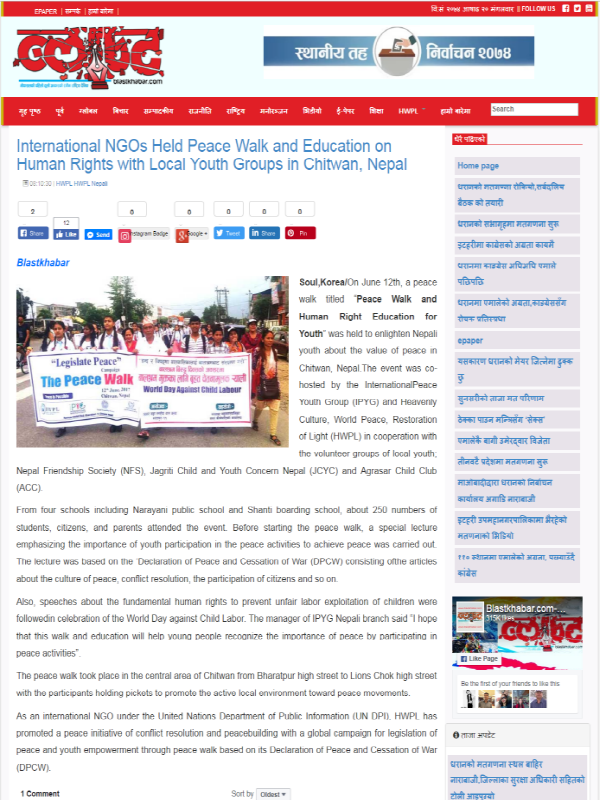 Soul,Korea/On June 12th, a peace walk titled “Peace Walk and Human Right Education for Youth” was held to enlighten Nepali youth about the value of peace in Chitwan, Nepal.The event was co-hosted by the InternationalPeace Youth Group (IPYG) and Heavenly Culture, World Peace, Restoration of Light (HWPL) in cooperation with the volunteer groups of local youth; Nepal Friendship Society (NFS), Jagriti Child and Youth Concern Nepal (JCYC) and Agrasar Child Club (ACC). 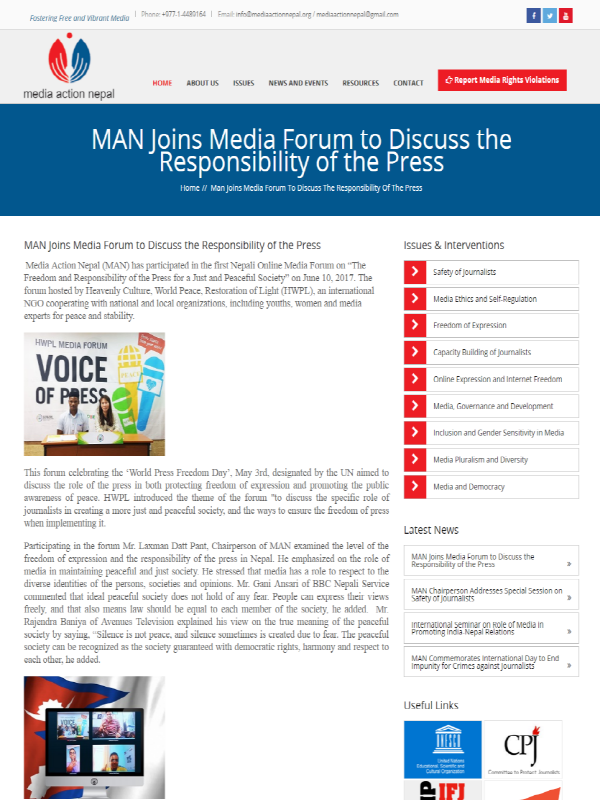 Media Action Nepal (MAN) has participated in the first Nepali Online Media Forum on “The Freedom and Responsibility of the Press for a Just and Peaceful Society” on June 10, 2017. 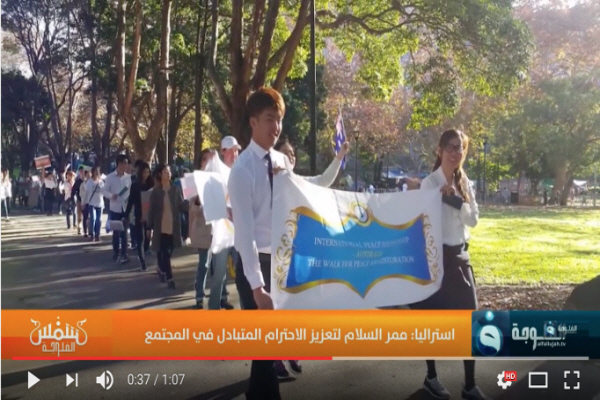 The forum hosted by Heavenly Culture, World Peace, Restoration of Light (HWPL), an international NGO cooperating with national and local organizations, including youths, women and media experts for peace and stability. 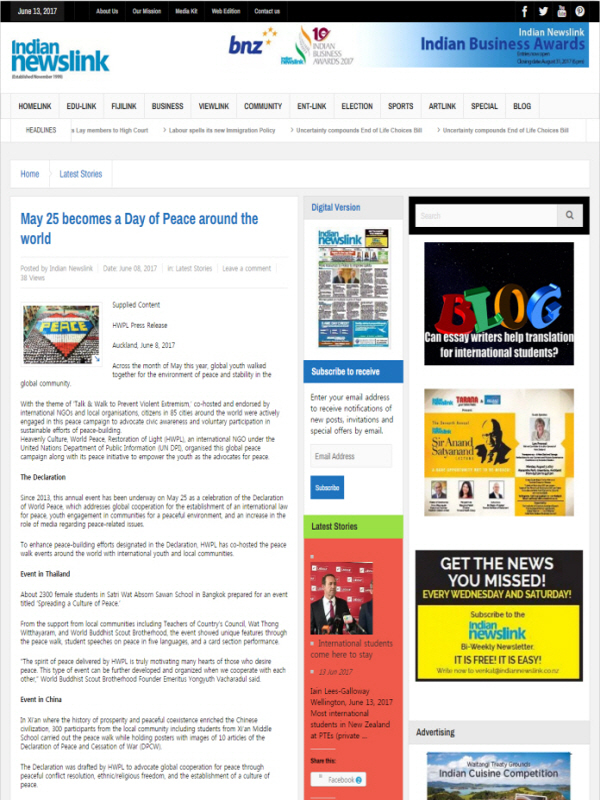 DAVAO CITY —A Korean-based global peace organization has lauded the wider global participation of people to commemorate the annual observance of the day of peace. The gain is starkly juxtaposed with two daring extremists’ attacks on civilian targets by Islamic State-linked armed groups in Marawi City in southern Philippines and Iran’s capital in Tehran, which the Islamic State of Iraq and Syria has recently congratulated in an Internet message this week. Today's global community is facing widespread extremism that accompanies violence with radical views, which has become a great concern for stability and prosperity of the globe. National governments around the world have responded to the contemporary issues of extremism by domestic policies and international cooperation on security and education. Across the month of May this year, global youth walked together for the environment of peace and stability in the global community. 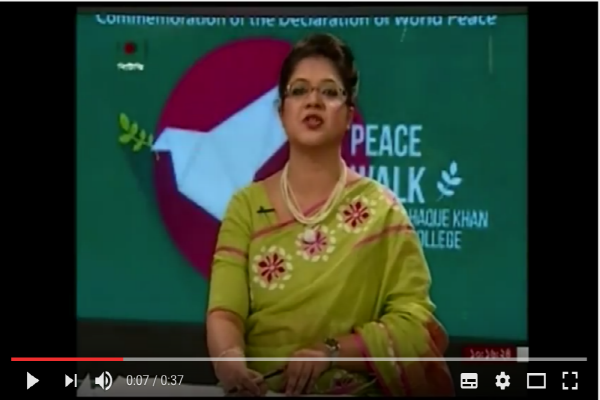 With the theme of ‘Talk & Walk to Prevent Violent Extremism,’ co-hosted and endorsed by international NGOs and local organisations, citizens in 85 cities around the world were actively engaged in this peace campaign to advocate civic awareness and voluntary participation in sustainable efforts of peace-building.